The External Storage feature on your Linksys Smart Wi-Fi Router will enable you to share files within your network. Follow the instructions below on how to enable this feature using the Linksys Smart Wi-Fi Account. IMPORTANT: If you are using a previously configured hard drive, you will receive the following message. Click Continue in order to use the new USB features. NOTE: This will not delete any data on the drive. Log in to your Linksys Smart Wi-Fi Account. To learn how to do this, click here. On your Linksys Smart Wi-Fi Account home page, click on the External Storage Tool. Click on the Folder Access tab. Set the Secure Folder Access to ON. What does the Secure Folder Access feature do? Leaving this feature OFF will allow unsecured access to your shared folder. Once you turn it ON, it will automatically activate the prompt to ask for login details. By adding Authorized users, you can specify which users in your network can access certain folders in the External Storage. You can limit access to some folders in your shared drive as well. Default Authorized users like the admin users can access all folders while guest users can only access media folders. Add a Username and enter your desired Password. Set Permissions then click Add user. NOTE: The Edit option will appear if the shares are already configured for the specific user. Creating specific shares will enable you to take control and manage which folders are accessible to certain users that access your External Storage. To learn how to create shares on your External Storage, click here. Once your shares are already set up, you can now configure each authorized user to access them. NOTE: In this example, the authorized user that is being configured is Kids. 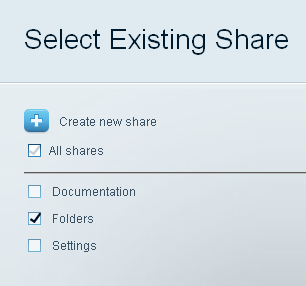 Select the specific folder that you want to share then click OK. NOTE: This procedure will allow the user to access specific folders on your External Storage.